Why would you want to wear a blood red-colored Halloween costume? More often than not, love is what most will immediately associate with the color red. Red comes across as such a happy and bright color, bringing cheer to the hearts of people. However, love is not the only thing that is colored crimson. Love the color red or think it's the perfect shade for Halloween? Blood is also red in color. This is something that sustains us and, if too much of it is spilled, it can lead to our deaths. This is what makes red such a perfectly apt color for Halloween. It can come across as a dangerous color and even a portent of doom. After all, who wants their blood spilled? A really dark shade of red can even be reminiscent of darkness itself, giving this color an opportunity to be scary and frightening. However, lighter shades of red can appear beautiful and breathtaking, allowing you to draw attention to yourself in a way that is much different from how terrifying creatures can do the same. As such, whether you're looking to be scary or not on Halloween, there is sure to be a red-colored costume that can fit the criteria of what you're looking for. So, what are some of the different kinds of blood red-colored costumes that you can choose to wear for Halloween? Look sinister and yet glamorous with this red-colored outfit. Don't forget to add a pitchfork if you want to complete your devil look. When we're talking about red-colored Halloween costumes, one of the very first that comes to mind is no doubt the devil outfit. Devils are commonly thought to wear red clothing while possessing red horns, a red tail and even the red pitchfork. It's an interesting contrast to angels who are usually thought of and portrayed as light beings that wear white-colored clothing. This really goes to show how red can be a dark and evil color. Of course, even if that's the case, there's no reason why you can't be a devil and yet still look stylish and stunning at the same time. The devil costume featured to the right has the ability to look highly attractive and appealing especially considering the flaming cuts on the dress and the way it has been so beautifully designed. To complete your devil look, you might want to acquire a red pitchfork, which is, unfortunately, not included with this costume. 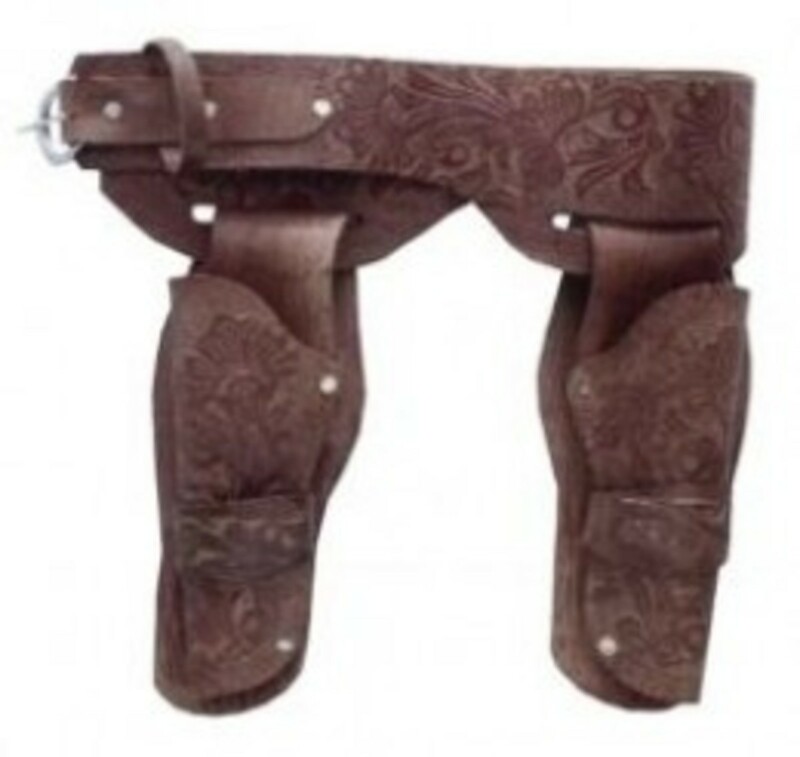 This particular outfit even includes the hat, which makes you look like the captain of the pirates, and the belt pouch with the skull and bones design, which adds to your cool look. If you feel like waving swords around instead of devil's pitchforks, then you might be more inclined to dress up as a pirate for Halloween. Who says only men can be pirates? 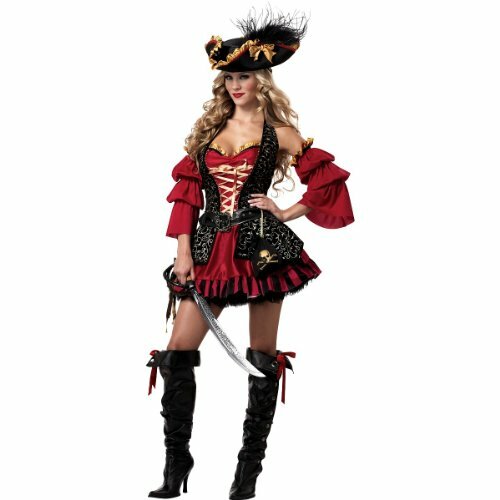 With costumes like the one shown below, even women can be pirates and they can look exceptionally good while being one. The red color of the outfit contrasts nicely with the black colors. You can look at it as showing the darkness of the pirates and how they are quite capable of spilling blood. While there's no need to spill blood for real, you might still want the pirate sword anyway, just to complete your look. Unfortunately, you'll have to acquire this separately as it doesn't come with this costume. Have fun waving your pirate sword around and acting like a real pirate. Perhaps you can even challenge some people to a mock sword fight. But be careful not to hurt anyone. This one is perfect for those who want to dress up as a fairy tale character and yet still want red colors on their Halloween costume. Feeling oddly reminiscent this Halloween? Thinking back to your childhood? Fairy tales and the like aren't just for children. There are adult costumes for such characters as the Little Red Riding Hood such as the one that you can see to the right. Of course, the word 'little' could certainly be omitted from the name already since this particular outfit certainly fits adults more than it would fit little girls. It's because of how there seems to be something darker lurking within this outfit. Perhaps it's due to the deep blood red color of the costume as well as the dark black colors that make up parts of it. If you're going to a Halloween event with the whole family, maybe you could all consider donning costumes that have the same theme. For instance, if one of you is going as the Little Red Riding Hood, then the others could go as the rest of the characters from said story. Someone could be the wolf and another the grandmother. If there are a lot of you, there could be two of each character. Of course, there's no need to limit yourself to Little Red Riding Hood characters. You could go with, say, Disney movies and dress up as the princesses and the other protagonists or even the villains. It's entirely up to you and your family. Perfect for those who want to be a witch for Halloween while still being able to wear something red-colored. For a classic Halloween look, you could dress up as a witch since witches are one of the more popular costume choices out there. And this is why you can find a whole multitude of Halloween witch costumes in different styles, designs and even colors. If you want to veer away from the traditional witch look, which mostly consists of a black-colored outfit complete with a pointed black hat and perhaps even a black-colored broom as a prop, you could instead opt to wear a red-colored witch costume such as the one you can see to the right. The bright red color of this outfit is sure to help you stand out in a crowd and make you sufficiently different enough from all the others who opted to dress up in a traditional black-colored witch costume. With this costume, you could be a fairy with fire powers or even a summer fairy. The large, intricate-looking wings are included with this outfit. The petal sleeves can be detached. If you want to wear wings with your costume and pretend to be able to fly, then consider donning a fairy outfit, which will definitely give you the chance to wear a pair of wings. There are many different kinds of fairies out there and their outfits vary depending on what they are supposed to be. For instance, a water-type fairy would be more likely to wear a blue-colored dress (to represent the water element, of course, but you knew that already) as opposed to, say, a red-colored one. Fairies that wear a red outfit could be fire-type fairies. They could even be associated with that of the red rose or perhaps the autumn or even the summer season because of the crimson color of their dresses and their wings. If you prefer to wear a large pair of wings, then look at fairy costumes such as the one to the right. Not only are these red wings large, they also look intricate and detailed. The same could be said of the red dress, which even includes petal sleeves. The shoes aren't included with the above costume, which is just as well considering its black color. It would be more fitting to wear crimson-colored shoes with this outfit. Perhaps you can even paint your toenails red unless you're planning to wear closed shoes that hide your toes. The next featured red-colored Halloween costume (which you can see to the right) is very interesting because it is part fairy and part devil. It is a beautiful-looking combination of a red fairy and a red devil costume. 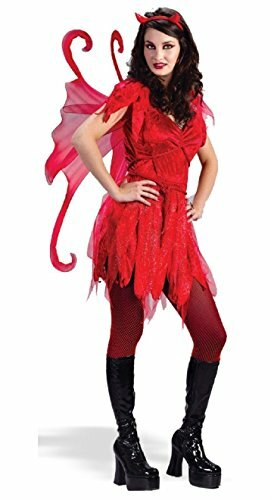 So if you can't decide between a fairy and a devil costume, you can be both thanks to costumes like the Devil Fairy Costume. With this, you get to wear the red pair of wings and don the devil-horned headband to complete your fairy and devil look. Maybe you can even get yourself a red-colored pitchfork to act as your fairy wand. So far, we've had costumes that are red in color, some being fully red while some consisted of other colors to balance the red. But, wouldn't you think that nothing says scary and terrifying than seeing someone covered in blood stains from top to bottom? Just take a look at the costume to the right as an example. Doesn't it make you wonder where all that blood came from? After all, it could be the blood of people that the person in the image killed or it could be the person's blood as she was injured by her enemies. Or perhaps it's actually a combination of both. Maybe she was running from her enemies who had managed to injure her but she wasn't able to get away without retaliating and fighting back. Make people wonder as to the story and origins of the blood stains in your costume and in your person by wearing blood-stained outfits. Costume with blood stains for those who want to look extra scary. You even get the wig with this costume so you shouldn't have to add blood stains to your hair however, you do have to add it to parts of your skin if you want to appear believable. For props, you might consider carrying a fake sword or dagger, which, of course, would also have blood stains on it for added effect. By adding a blood-stained crown or headpiece to this particular costume, you could turn yourself into a queen or princess seeking revenge on all those who'd wronged her. 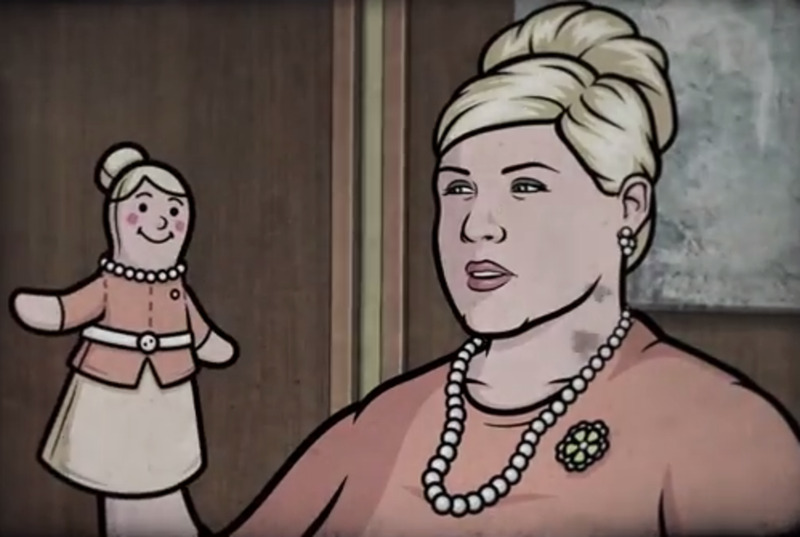 The riveting and intriguing story of your blood-stained costume is entirely up to you. If you're a fan of mythology, then you could decide to be a goddess for Halloween. There's no need to limit yourself to Norse, Egyptian or even Greek goddesses as there are many more out there that you can choose from and you can even make up your very own goddess, if you want to. Since love isn't the only thing that can be associated with the red color, the Women's Ruby Goddess Adult Costume featured to the right doesn't have to mean that you're going to be Aphrodite, Venus or some other love goddess. In fact, the red costume below doesn't actually specify a particular goddess, which means that you can wear this outfit and be whichever goddess you want to be. You could be some sort of fire goddess thanks to the fiery red color of this particular costume. You even get the arm cuff and head piece as part of this outfit, which really helps to complete your goddess look though, if you prefer, you could instead get red-colored accessories. What kind of red-colored costume will you be wearing for Halloween? 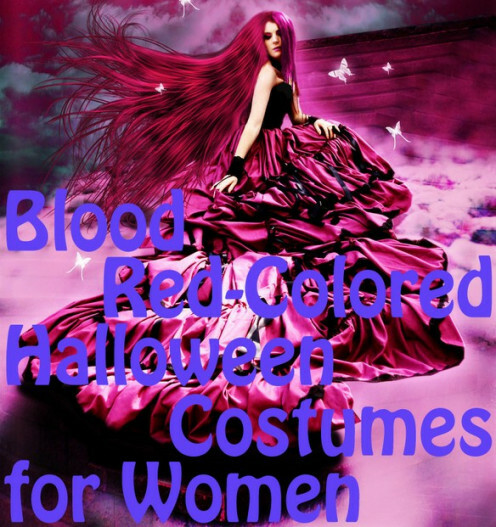 These are just some of the many different kinds of red-colored costumes that you can wear for Halloween. The color red can mean a number of different things and it's entirely up to you as to how you want your costume to be. You could be dressed all in red such as by being a devil or you could dress up in a combination of red and other colors such as by donning a pirate costume. You could attempt to look scary by wearing a blood-stained outfit or you could go for glamorous and magnificent by dressing up in a stylish and beautifully-designed goddess costume. Why And How To Dress Up As Female Disney Villains For Halloween? Why don't you consider dressing up as a female Disney villain for Halloween? Why would anyone want to? If you decide to do so, what are the things that you would need for this? Want to wear black for Halloween while still looking elegant and stunning? Check out these dark black costumes for women that don't necessarily have to be terrifying if you don't want to scare people. Why would you want to wear a white-colored costume for Halloween? Can you be scary with a white outfit? Can you look beautiful with a white dress? What are some of the different white-colored costumes that you can choose to wear for Halloween? @WiccanSage - thank you. I like the goddess costume too but there are so many different kinds of Halloween costumes to choose from and they all have different colors, styles, designs, etc that it's hard to decide what or who you should be for Halloween. Very cool. I like the goddess costume. I think these look great. I haven't even decided what to be yet, but red is inspiring. Thanks for sharing, great hub-- can't wait till Halloween. @FlourishAnyway - thanks for the comment. I think those are great and nice-looking Halloween costumes too. The pirate one looks quite detailed and intricate and the flaming cuts on the devil lady costume look perfect as well. I like the devil lady or the pirate.